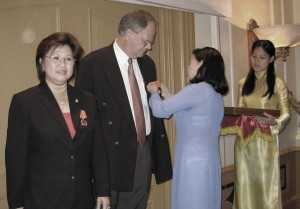 In August 2012 Vietnam Outreach celebrated it’s 25th anniversary. 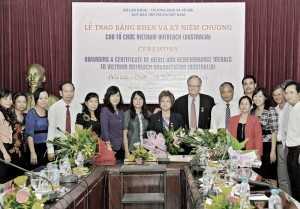 The Vietnamese Government expressed their appreciation for the help we have given Vietnam by awarding the 4th medal presented to Vietnam Outreach, this time from the Minister for Labour and Invalids in Hanoi. 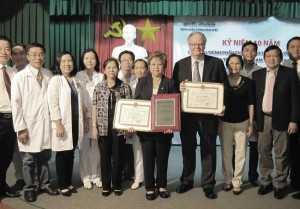 Additional celebrations and awards for appreciation were made by the Vietnamese Ministry of Health (Bo Y Te) in Hanoi and the Chairman of Ho Chi Minh City. 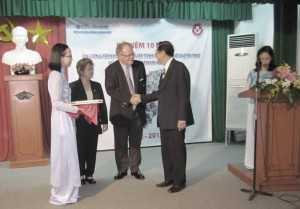 Many officials travelled from all over Vietnam to join in these celebrations and some said that they were privileged to work with us for so many years and some shared how they had learned that love is not just talk but also by actions. 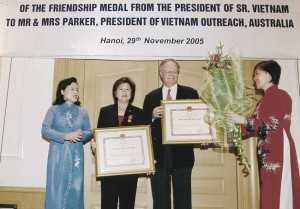 On November 29th of 2005 the President of Vietnam, Tran Duc Luong awarded Ralph and Linda Parker on behalf of Vietnam Outreach the Vietnam Friendship Medal. 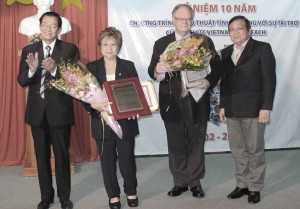 This is the highest award that can be given to foreigners, and never before in the history of Vietnam had it been awarded to an NGO (non-government organisation) being usually reserved for heads of state. 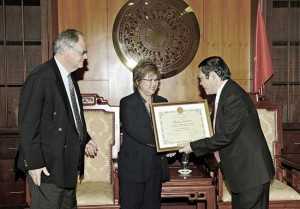 The presentation was made at a grand ceremony in Hanoi where many senior officials gathered for the event, which was followed by a lavish banquet. 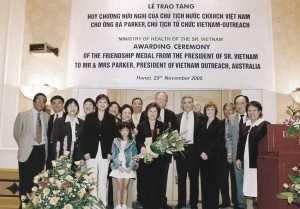 When we asked why Vietnam Outreach was chosen for this historic award when there are much larger NGOs working in Vietnam, we were told that whilst those organisations were indeed very large, they were bureaucracies, but with Vietnam Outreach, it was our heart. In our acceptance speech we shared how we were receiving these medals on behalf of all who have sacrificially sown to see precious lives changed, for love is measured by the actions it compels. 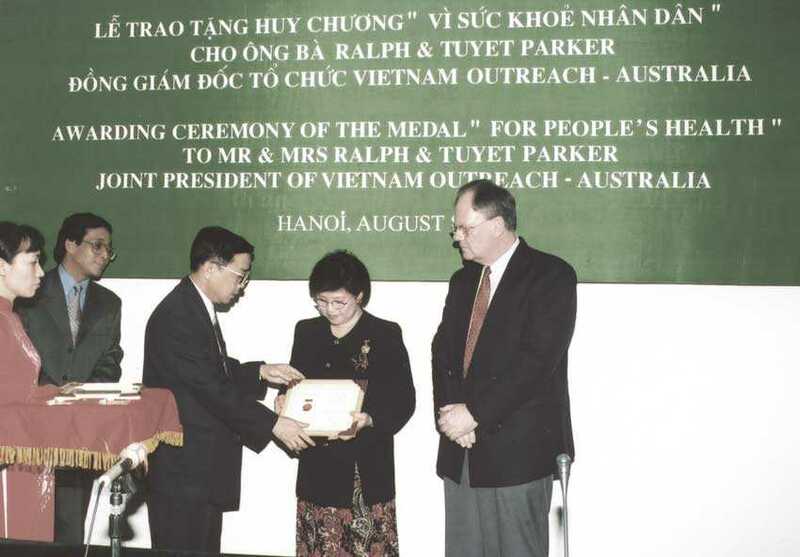 In recognition of the help Vietnam Outreach has given to thousands of handicapped and orphaned children the Parkers were each awarded medals for “The Care and Protection of Children” in 2001 by the Vice President of Vietnam. 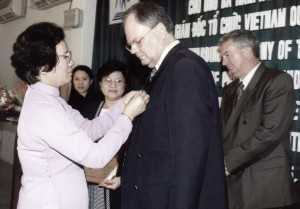 In 2001 Vietnam Outreach was honoured by the Ministry of Health when we were awarded “The People’s Health” medal in recognition of our health care development work.